In Grip, everything is your race track, and if your tyres can stick to it, you can drive on it. Caged Element, the studio behind Grip, wanted to recreate the high octane thrills of '90s racer Rollcage, but bring it bang up to date with sharp visuals, gravity-defying physics, insanely high speeds, killer weaponry, and a brain-thumping soundtrack. Thankfully you're not hit by all of this intensity at once though. 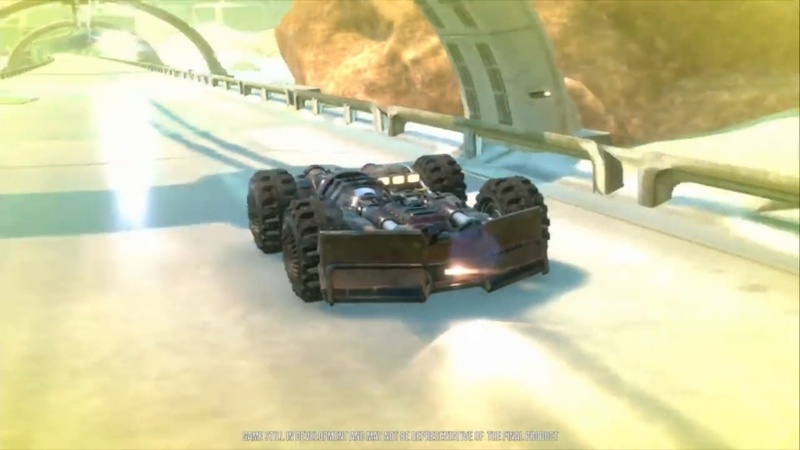 Grip has a gentle learning curve that gradually eases you into this intense futuristic racer. Throughout the campaign mode, you'll play through eleven tiers of racing, each with multiple tournaments, in order to perfect your driving skilfirstt frist it's the speed of it all that you'll have to get to grips with (pardon the pun), as you learn how to get a perfect start, how to utilise boost pads and the turbo boost, and the random drops littered across the tracks. Those familiar to Wipeout, F-Zero and other futuristic racers shouldn't have too much trouble with this though. You're guided slowly through each of the game modes as you progress through the tiers, unlocking the various styles of gameplay in the main menu as you go. Starting with Speed Demon, a pure flat-out style of racing with no weapons, followed by Classic Race, again simple racing but this time with basic weapons to take out your opponents. Deathmatch is an arena battle where the only aim is to destroy the others cars by driving over weapon pickups and unleashing hell on your opponents. And it's those who earn the most points in this great winner-takes-all destruction derby. Another mode is Ultimate Race, but this isn't a race per se, more of battle along a track where coming first requires earning points by blasting your opponents with a choice selection of weapons. Speaking of which, there is a nice selection of weapons at your disposal, including miniguns, rockets, cluster bombs, even distortion fields that disrupt nearby opponents, but as with everything in the game these are all unlocked as you progress through the campaign tiers. Being a futuristic racer, the game takes place over four vastly different planets, giving us twenty two tracks to race upon. Liddo 5 is a green mountainous planet with huge open plains, tight tunnels and is home to the Speed Bowl, a massive oval track not dissimilar to the speedway tracks of NASCAR but with a ceiling that can be used as part of the track as well. Norvos is an ice planet, but it's got a super hot core. The tracks here range from ice-covered high altitudes, to rocky outcrops, as well as deep, lava-filled caverns full of dangers. Jahtra, in contrast, consists of desert plains not too far removed from those on Tatooine in Star Wars, in fact, speeding through these tracks feels a lot like pod racing at times. Finally, there's Orbital Prime, an industrial planet filled to the brim with a sprawling metropolis and huge spaghetti junction freeways. These tracks are by far the most complex and with that, the most frustrating, where taking a knock and spinning out can mean that you can quite easily find yourself driving not only the wrong way but on completely the wrong track. There is a large selection of cars to be unlocked as you progress through the game and each is customisable, although this really only boils down to paint jobs, decals, rims and tyres which are all cosmetic and don't affect how any of the vehicles handle. This is a great shame as adding modifications to the grip, strength, speed and acceleration would have been more engrossing than just selecting a slightly different car. As we said earlier, progressing through the campaign will unlock modes in the main menu. Here you can select the game modes you've unlocked and play them either in single player against AI-controlled opponents, online in private or public races, or against friends and family in up to four-player split-screen. These social modes are great for some of the games we haven't mentioned yet, and if you progress far enough through the campaign tiers you'll unlock Steal the Stash and Time Bomb. Steal The Stash is a cops and robbers style mode that pits you against an opposing team. You have to steal the loot from their base and get it back to yours before the time is up. Time Bomb sees one car strapped with a timed thermobaric bomb, who is hell-bent on taking everyone down with them. You have to try to avoid the explosion, and any cars caught in the blast become mini mobile bombs themselves, as everyone competes to be the last vehicle driving. Finally, there is Carkour, which as the play on words suggests is parkour for cars. Here there are nineteen courses, ranging from simple loops and jumps to complex tracks and cityscapes that will drive you insane as you try to find all the collectibles as fast as you can. One particularly difficult track, the aptly named Rainbow Road, reminded us of certain Mario Kart track which consists of just a ribbon of looping twisting track with no sides. It is insanely hard but we took great satisfaction from completing it. The handling is quite good, if a little twitchy under low speeds, and you'll soon become accustomed to the breakneck twists, turns and the ability to defy gravity and drive on walls and ceilings a high speed. That being said, there are some issues with camera angles that can really jar the experience, and flipping between vertical and horizontal tracks can sometimes cause the view to become a little twisted which can be quite disorientating. There is also no real map or guidance to show you the best route to take, and while this leaves the racing path up to you, make a small detour in the wrong direction and you may as well restart the race as there is no quick way back to the front. 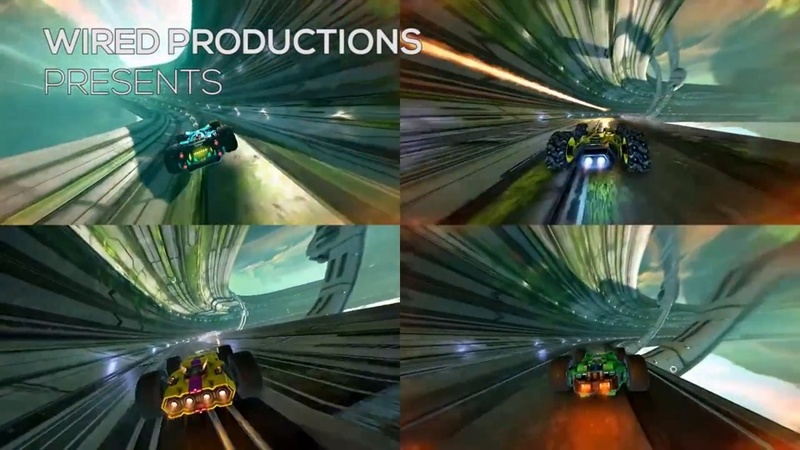 Keeping up with the Rollcage-esque theme of the game, the soundtrack is compiled with a host of drum & bass tracks, along with a few techno and trance numbers. Nothing quite to the level of Fatboy Slim's Love Island, but still certainly enjoyable and quite fitting for the style of game. One big problem we had, however, was the engine noise; while the audio is adjustable in the settings, the cars were set at a level that was just too loud to begin with and after just a few initial races we realised we couldn't actually hear any music at all under the drone of the engines and the screeching of tyres. After a bit of adjustment, we soon found an appropriate level to enjoy it, but it seemed odd not to have been balanced at the start. Lots of modes, intense racing action, nice variety in terms of tracks. Vehicles could have been more customisable, unlocking modes via solo play was a little frustrating, some camera issues. ActionJackson on the 14th of November 2018 at 18:46. I cant wait to play this, I have had my eye on this beauty for an eternity, Finally Grip cometh!! !